These plants are the most popular when it comes to garden landscaping as these are low in maintenance and last an entire season. Ground cover plants grow fast and have the ability to form into beautiful blankets of blooms at spots inaccessible by other plant varieties. These produce blossoms in various colors like yellow, white and purple and are mostly used on edges or borders of gardens. Known as Blue Haze Spurge, this ground cover plant produces blooms in later part of spring and looks very pretty with chartreuse toned blossoms and blue foliage. This ornamental plant grows well in full sun and reaches up-to 8 feet in height and measures 12 to 15 inches in width. These plants thrive well in sunny spots and also in containers. Gardeners grow Blue Haze in front of other perennial plants to lend more attractiveness to the landscape. Sedum is an excellent choice for gardeners looking for a ground cover with yellow flowers. It is an ornamental succulent plant that thrives perfectly in full sunny spots. These plants are available in 400 varieties. Sedum needs well draining soil and is popular with people all over the globe. Sedum’s ability to grow in diverse climates makes it an excellent choice for beautifying gardens. Producing charming bluish purple star shaped flowers, Dalmatian Bellflower offers an attractive ground cover for your gardens in spring and summer. Its a perennial plant most loved for its rounded leaves. Its resistant to cold and thrives well in full sun and part shade. It prefers both alkaline as well as well as draining soils. The magenta pinkish blooms of the Cooper’s Hardy ice Plant offer a beautiful ground cover for your gardens. This plant is easy to maintain and is most preferred by gardeners. The fast growing ground cover plants like the Hardy Ice Plant are perfect for decorating borders, edges as well as spaces between rocks. These grow to reach a height of 2 inches and bloom vigorously in dry climates. Scarlet Tanager is a tough perennial plant that can tolerate cold easily and produces beautiful blooms in scarlet in the middle of spring and in the Fall. Its tolerant to drought and is small reaching up-to 3-4″ in height. If your garden has pathways made of gravel, then you can grow this plant on its edges. Ajuga is one of the most stunning ground cover flowers for shade and is both an annual as well as a perennial. Its also known as Bugleweed and offers an attractive ground cover for your garden. It grows rather fast, often sabotaging the growth of other plants. Most popular is the Ajuga Reptans variety that bears spiky blue flowers. If you’re searching for stunning ground cover flowers for shade, then Lily of the Valley must be mentioned for its a plant that thrives well in shade and produces lovely aromatic blooms in white. The blooms last for a long time and brighten up any shady spot in your garden. Since it grows very aggressively, you need to keep a check on it before it takes over much of your landscape. These plants are perfect for growing in lawns as they can tolerate foot traffic nicely. The Brass Button looks very attractive and offers an excellent ground cover of yellowish golden toned blossoms. These are evergreen only in USDA Zones 8 to 10. Creeping Phlox is a sturdy and low maintenance ground cover plant you all can easily grow in between rocks in your gardens. It produces lovely looking blossoms in pastels that help in covering bald patches in your gardens. If your garden has many flower beds, grow this plant on the borders and see your landscape transform into a paradise. Also known as Liriope, this plant is actually not a lily but a good looking ground cover plant. It looks showy and boasts of foliage that resembles grass. Lilyturf bears lovely looking violet toned blossoms that bloom fully in later part of summer and last till fall. In colder climates, Lilyturf needs full sun, while in warm regions, it grows perfectly in partial shade. You can edge your walkways with this plant. 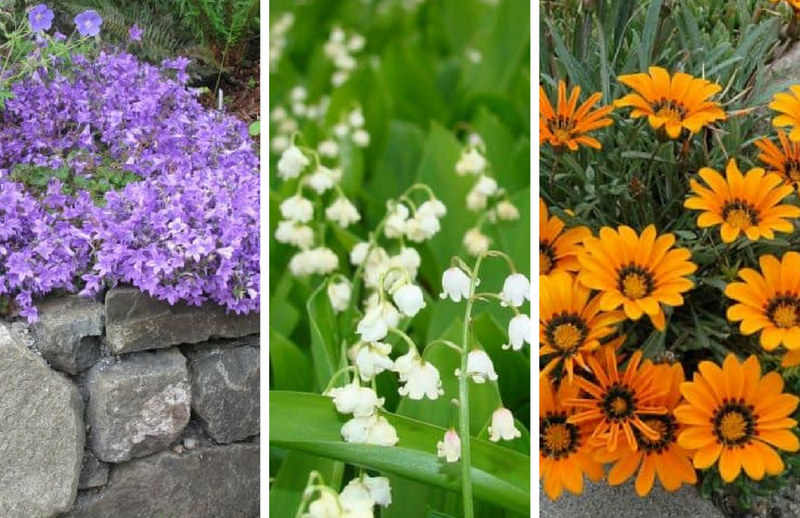 The most popular varieties to grow are Spicata and Muscari.